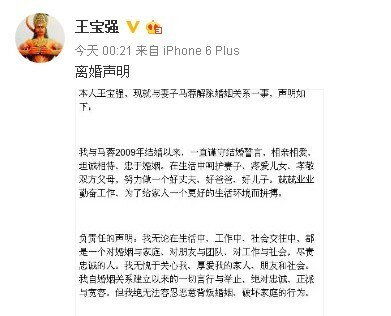 Chinese actor Wang Baoqiang has published a surprise announcement on his Weibo account (China's Twitter-like micro-blogging platform) saying he will divorce his wife Ma Rong and accused Ma of cheating on him with his manager. 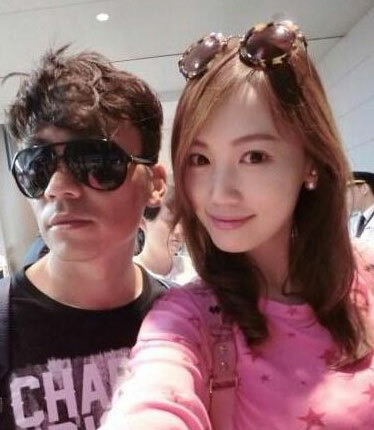 In the posting in the wee hours of Sunday morning, Wang said he has fired his manager Song Zhe, accusing Song of breaking up his marriage. Later on Sunday morning, Ma accused Wang of abandoning his family and friends on the social media app Wechat, and Ma said it's not the right time to say anything more. Ma also said on her Weibo that he who excuses himself accuses himself, and that good and evil will reveal themselves in the end. Wang Baoqiang and Ma Rong were married in 2009, and have a daughter and a son. Wang gained popularity for his appearance as Shagen in Feng Xiaogang's 2004 film "A World Without Thieves," where he played a naive village boy carrying his life savings in cash home with him on a train. He has since starred in other hit films such as "Lost in Thailand" and "Monk Comes Down the Mountain."